GASB’s “Big Three” hold the greatest possibility for change in governmental accounting and reporting. The Governmental Accounting Standards Board is working on several projects that will have a great impact on the future of financial accounting and reporting for public colleges and universities. Substantial GASB projects can take the greater part of a decade—from pre-agenda research through the issuance of final guidance. Each project phase comprises research, outreach, stakeholder feedback, discussion, and deliberation. So what drives or determines these projects? The process is broad and sometimes complex. Constituents made up of preparers (controller’s office) and users (e.g., academics, oversight groups, citizens, investors, analysts) provide input to GASB through surveys, an online portal, written comments, public hearings, meetings, and its advisory council—GASAC (Governmental Accounting Standards Advisory Council). Additionally, GASB staff monitor Financial Accounting Standards Board projects and evaluate possible governmental applications. According to Concepts Statement No. 3, Communication Methods in General Purpose External Financial Reports that Contain Basic Financial Statements, notes to financial statements are integral to financial statements and as such are essential to understanding financial position. At the time pre-agenda research was approved in 2016, it had been nearly 20 years since GASB had done a comprehensive review of note disclosures. Moreover, since that time, GASB has issued more than 50 accounting standards. 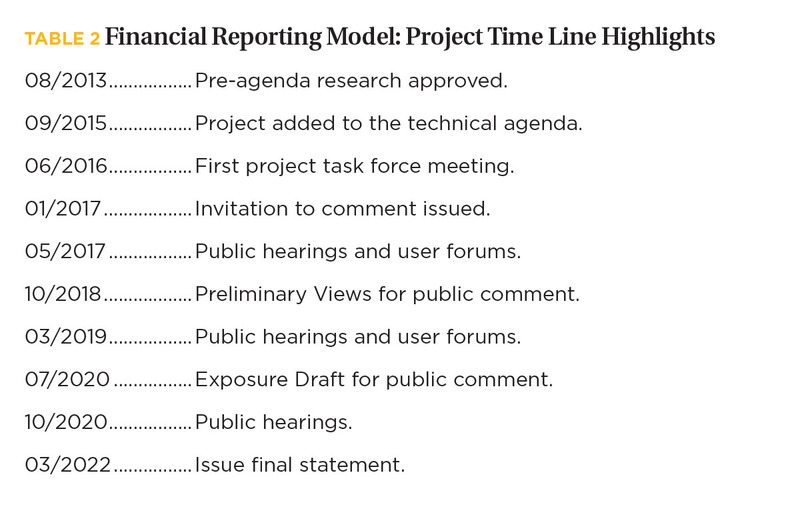 During early disclosure research, GASB staff heard polarized views from financial statement users and preparers. Many felt that the number and volume of notes had grown exponentially since Concepts Statement 3 was issued—creating a burden for preparers and interfering with a user’s ability to discern truly important information from the notes. Others felt that, although voluminous, the vast majority of information disclosed was crucial to understanding a government’s financial position and accountability. Public colleges and universities pointed out during GASB’s pre-agenda research that significant note disclosures have more than doubled the number of pages comprising audited financial statements since the issuance of Concepts Statement 3. Notable examples of extensive disclosures in higher education include deposit and investment risk, fair value, derivative instruments, pensions, and other postemployment benefits. Further, additional guidance around materiality considerations, combining related disclosures, and perhaps, relocating significant accounting policy information elsewhere, or following the notes, might improve a user’s ability to tackle and relate disclosures to the basic financial statements. Over the next year, the notion of essentiality will be thoroughly explored by staff and board before the issuance of a Preliminary Views (PV) for public comment. This deep-dive application will examine dimensions of various disclosure requirements to determine how vital and indispensable they are in explaining corresponding financial statement information. The significance of this project is evidenced by the appointment of a project task force. Tom Ewing, former chair of NACUBO’s Accounting Principles Council (APC) and associate controller at The Ohio State University, Columbus, Ohio, will represent higher education. 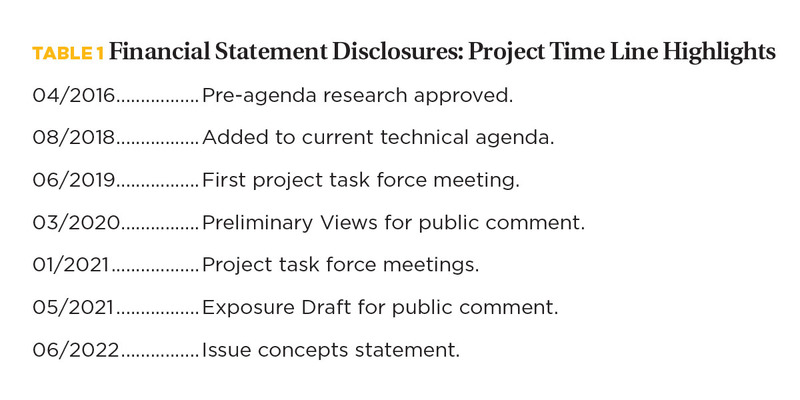 NACUBO encourages public institutions to follow this project and pay close attention to stakeholder questions about financial statements and disclosures, as well as their efforts to produce disclosures (see Table 1 for project time line). This agenda item should also open the door to conversations with auditors. Both preparers and auditors tend to coalesce around historic precedence, but the attention of board and staff to disclosure concepts creates opportunities for streamlining, materiality re-evaluation, and warranted deletions or additions. Conversations with auditors will also inform comments to standard setters. Statement 34, Basic Financial Statements—and Management’s Discussion and Analysis—for State and Local Governments, was the culmination of 15 years of board and staff work. Subsequently, a project to assess its effectiveness was added to the technical agenda in 2015. The time line for a revised standard (target: 2022) will mark close to 10 years of research, staff outreach, constituent comments, public hearings, and board discussions and deliberation. This is a significant undertaking, and public colleges and universities will want to pay attention during the current PV comment period and beyond (see Table 2 for project time line). Although pre-agenda research indicated that most of the model’s components are effective, GASB’s constituents identified a number of areas in need of improvement. 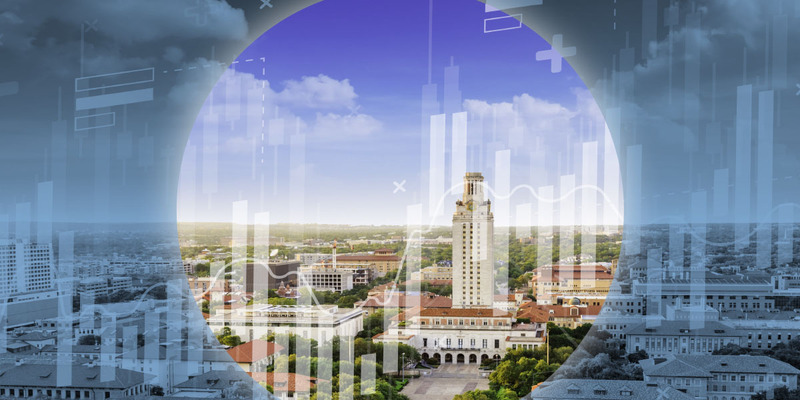 Most notably for public higher education were an operating measure definition and prescriptive presentation that are not considered valuable by financial statement users. Although the vast amount of work on this project addresses government fund reporting, foundational conceptual discussions offer an opportunity for public institutions to understand the board’s thinking about governmental accountability, communication, recognition, and the connected role and reporting of proprietary funds and college and university reporting (proprietary funds or component units) in the government’s Comprehensive Annual Financial Report. Options for enhancing financial statement analysis in the Management’s Discussion and Analysis (MD&A). The board will evaluate the usefulness of certain boilerplate requirements and consider guidance for presenting information that will impact financial position. Operating indicator alternatives for Proprietary Fund and Business-Type Activity financial statements. The board will evaluate operating and nonoperating revenue, and expense definitions and presentation. The optimal placement of fiduciary fund financial statements in the basic financial statements. Reporting alternatives for the statement of activities. Whether a governmentwide statement of cash flows should be required and how cash flows would be presented if required. Additional information prescribed for debt service funds. A presentation framework for governmental fund financial statements and a separate conceptual framework for recognition of elements of government fund financial statements. Exploration of the best way to communicate budgetary comparisons and variances. An operating indicator for public institutions. The board generally believes that operating revenues and expenses should be defined as revenues and expenses other than operating revenues and expenses. Nonoperating revenues and expenses include subsidies, financing activities, resources from capital asset disposal, and investment income and expenses. 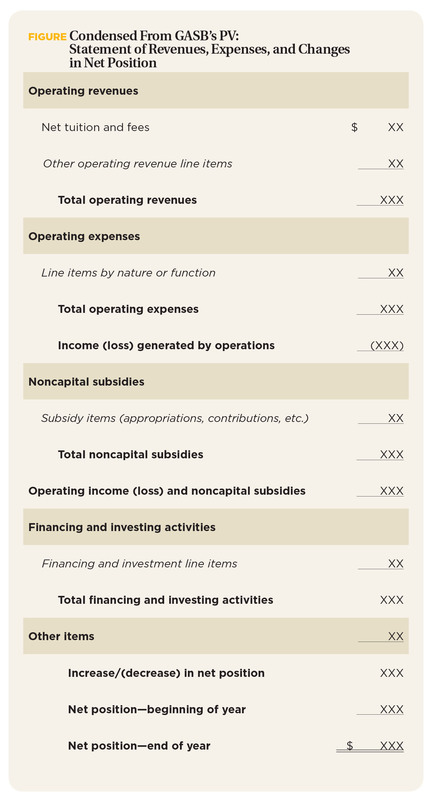 The board believes that the definition of operating revenues and expenses, and the description of nonoperating revenues and expenses should be consistent with the guidance for determining: operating, noncapital financing; capital and related financing; and investing activities as defined in Statement No. 9, Reporting Cash Flows of Proprietary and Nonexpendable Trust Funds and Governmental Entities That Use Proprietary Fund Accounting. As the GASB staff were researching the effectiveness of Statement 34, NACUBO staff and its APC began designing an income statement for public higher education that would clearly convey a meaningful reporting-period performance metric. NACUBO asserted that a reporting presentation can display how both fees and subsidies contribute to financial performance. NACUBO’s APC met with the full board in 2015 and presented its “alternative view” of the Statement of Revenues, Expenses, and Changes in Net Position (SRECNP). GASB staff researched a self-sustaining or subsidized approach to identifying whether activities are self-supporting or whether support resources such as subsidies are needed to maintain provided services to citizens. Considering this notion, the board deliberated the merits of NACUBO’s alternate view and preliminarily concluded that the SRECNP could contain an operating subtotal before subsidies (such as appropriations, contributions, or taxes) and an operating results total after subsidies but before financing and capital activities. See Figure, “Condensed From GASB’s PV: Statement of Revenue, Expenses, and Changes in Net Position,” for an abbreviated example of this presentation. Public institutions should continue to follow this project and provide feedback to GASB. Institutions ought to gather feedback from stakeholders on the proposed SRECNP to be able to provide information from higher education users to GASB. Proposed new MD&A guidance will appear in the exposure draft (target 2020 release). Since MD&A is a major undertaking for preparers, NACUBO encourages participation in additional research and field testing of any newly proposed requirements. Charles Tegen—associate vice president for finance, Clemson University, Clemson, S.C., and former member of the Governmental Accounting Standards Advisory Council and APC—represents higher education on GASB’s appointed financial reporting task force and works closely with NACUBO staff and the APC on this effort. NACUBO and its APC had an opportunity to talk with GASB staff about this major technical undertaking in early 2017. Staff explained that GASB’s ongoing work to finalize its conceptual framework, combined with earlier Financial Accounting Foundation (FAF) reviews of older standards, identified gaps in governmental accounting guidance. A notable gap is the lack of all-inclusive guidance on certain revenue transactions. Additionally, years of work by the Financial Accounting Standards Board led to revenue recognition guidance that is rooted in assessing performance obligations. 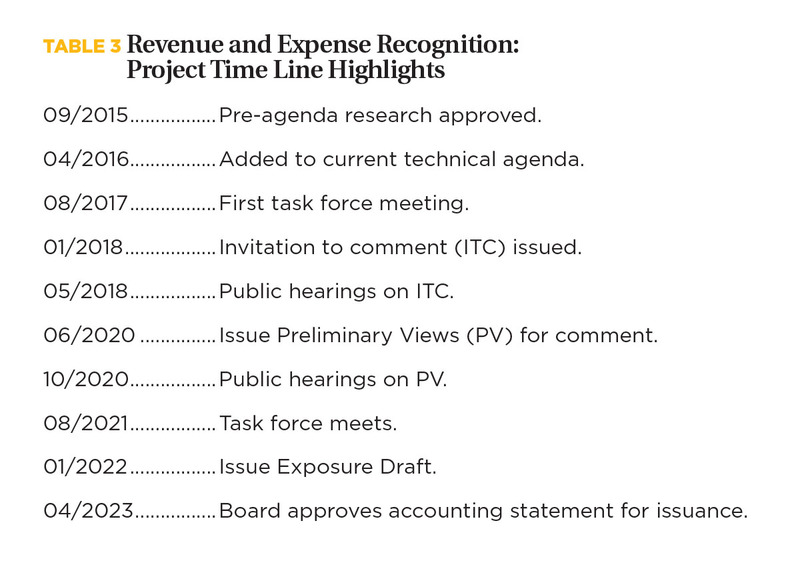 GASB will follow suit and explore if a performance-obligation approach to revenue recognition is best for governmental entities (see Table 3 for project time line). Should the performance obligation approach be used for transactions of a government? Should revenue be recognized at the time of an exchange, or when (or as) performance obligations are fulfilled? Should the approach be used only for exchange transactions? Should the approach be used for both revenue and expenses? GASB literature contains guidance for certain exchange expenses (compensated absences and postemployment benefits). Guidance does not exist for most other common exchange expenses, including salaries. A performance obligation/no performance obligation model. The exchange/nonexchange model would classify revenue and expense transactions based on the presence or absence of an exchange. Revenue would be recognized using an earnings approach in exchange transactions. Nonexchange transactions would apply the provisions of Statement No. 33, Accounting and Financial Reporting for Nonexchange Transactions. The performance obligation/no performance obligation model would classify revenue and expense based on whether there is a contract that contains at least one performance obligation. Revenue or expense recognition would be based on the satisfaction of the performance obligation(s). Transactions without performance obligations would follow Statement 33. In its comment letter, NACUBO encouraged GASB to pursue the exchange/nonexchange model and clarify its existing guidance. NACUBO noted that, since the ITC indicates a desire for the comprehensive revenue and expense model, it would be inconsistent to have significant accounting standards—such as Statements 68 and 75—pensions and other postemployment benefits—respectively, based on an employment exchange, and have something other than exchange and nonexchange constructs for all other transactions. NACUBO pointed out that private institutions have spent much time and effort on the performance-obligation approach, based on FASB’s revenue recognition guidance, because the binding nature of tuition agreements is a legal matter rather than an accounting matter. In public testimony, NACUBO representatives noted that sponsored research grants contain numerous performance obligations but fall under Statement 33; consequently Statement 33 would have to be updated with a performance/no performance obligation approach. Although a projected final standard is more than four years away and implementation may be at least seven years in the future, public colleges and universities will want to follow this project because of its sweeping ramifications. After all, revenue and expenses are a bit like the mom and apple pie of accounting and reporting, and it won’t be easy to replace mom! NACUBO and the APC will continue to monitor these “Big Three” projects, engage GASB, submit written comments, and testify. All public institutions are encouraged to closely follow this work and reach out to NACUBO to volunteer time or provide your views. Public institutions should gather feedback on the proposed SRECNP to provide information to GASB. The exchange/nonexchange model would classify revenue and expense transactions based on the presence or absence of an exchange.